Phyllis’s Dad Kenneth Hopper (“Ken”) died quietly in his sleep on Sunday following a long illness. Ken was in the second wave on the beach at Normandy, fought in the Battle of the Bulge, and was a prisoner of war in Germany. He had worked in Alaska in the 1950s, and fulfilled a long-time dream by visiting Pitcairn Island. He was married for over fifty years to Barbara. Ken had a sometimes gruff exterior. Paradoxically, at his core Ken was a gentle and sweet man. He loved his family. He had true serenity and great faith in his God. He will be missed. 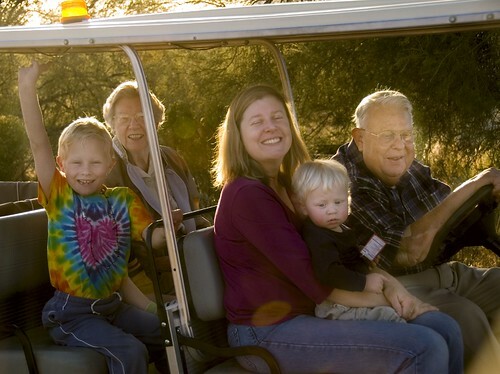 This photo shows Ken giving Barbara, Phyllis, and our kids (Ken’s grandchildren) a tour around his land in Arizona in his electric cart a little over a year ago. Related stories: Birthday Boy, Phoenix Roundtrip. 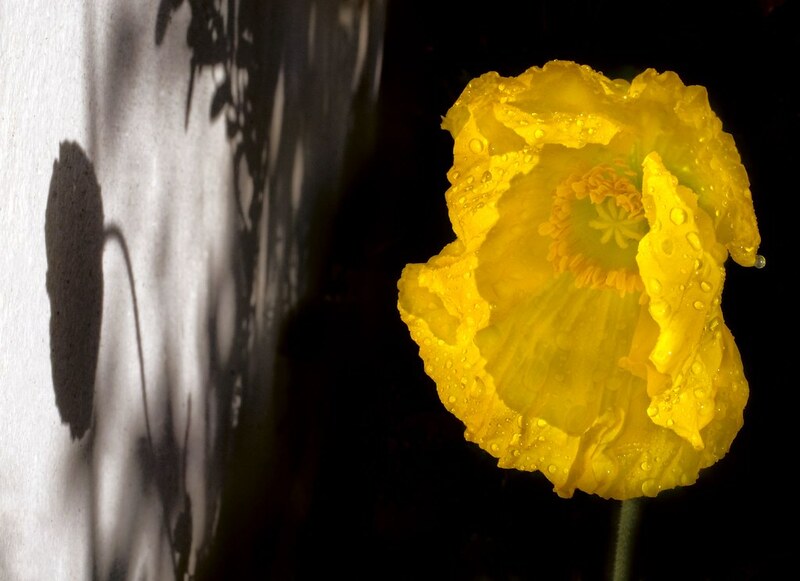 Papaver and Shadow, photo by Harold Davis. View this image larger. At first glance, one might think this image is a Photoshop composite of a black-and-white image and a color photo, but it is not a composite. It is a single photograph. This Papaver nudicaule (Icelandic Poppy) was gowing in a pot outside our front stairs. It rained the night before, and in the early morning. Then the sun came out. I took the photograph carefully, lens stopped down for depth of field, and exposing for the yellow flower because I knew I wanted the shadow area to go black. Then I processed the RAW file carefully a number of times for the flower, and with different color balance and exposure settings for the shadows. If you look carefully at the shadow areas, you can see that in fact they are not monochromatic, and tend toward the red side of things. 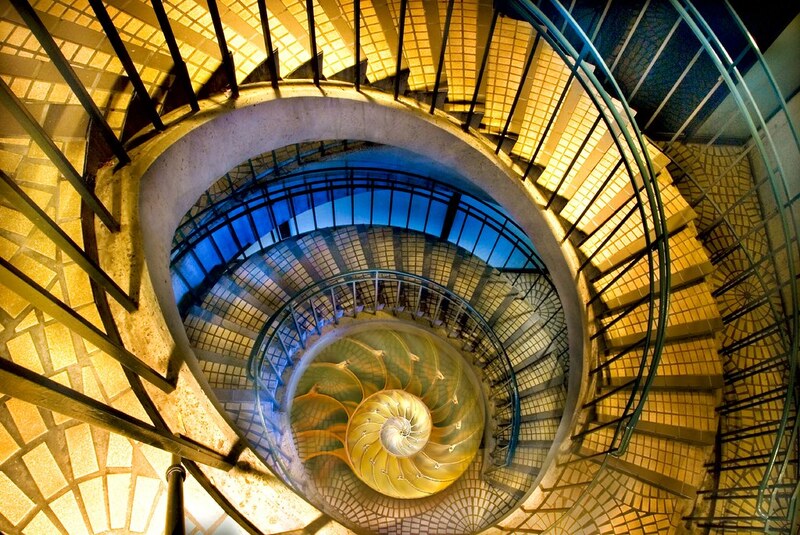 Spirals, photo by Harold Davis. View this image larger. This image is a composite created in Photoshop of one of the spiral staircase images from 2 Embarcadero and an image of a chambered nautilus (the shell image itself is a Photoshopped composite of a photograph and a flat-bed scan). 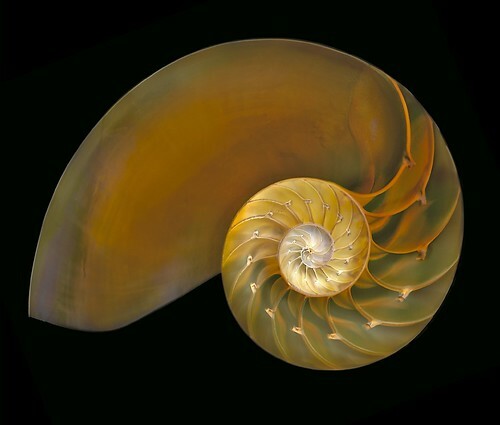 Nautilus on Black 2, photo by Harold Davis. View this image larger. 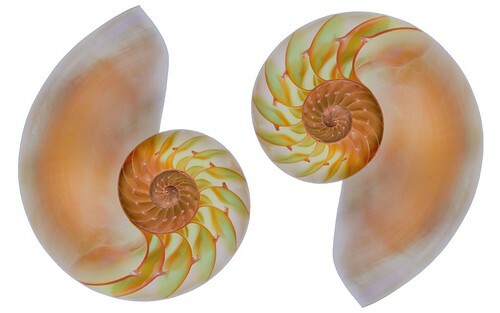 This version of the Nautilus shell uses Photoshop to combine a digital photograph with a high-resolution flat-bed scan (the center of the image). Wood between the Worlds, photo by Harold Davis. View this image larger. 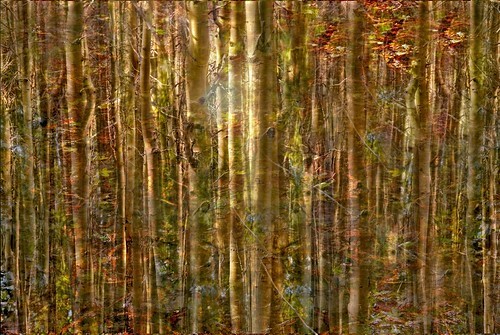 This is a Photoshop composite put together with layers and masking from Big Sticks and Water and Meditation. I was inspired by the Wood between the Worlds from C.S. Lewis’s The Magician’s Nephew in the Narnia series. This forest is a sort of sleepy no-place that exists outside of any world. When you look into any pond in the forest at first you see nothing at all except ordinary water and pond reflections. But as you look more closely, and possibly are sucked down into the pond, a whole new world starts to become apparent. Where does one “world” end and the next “world” begin? 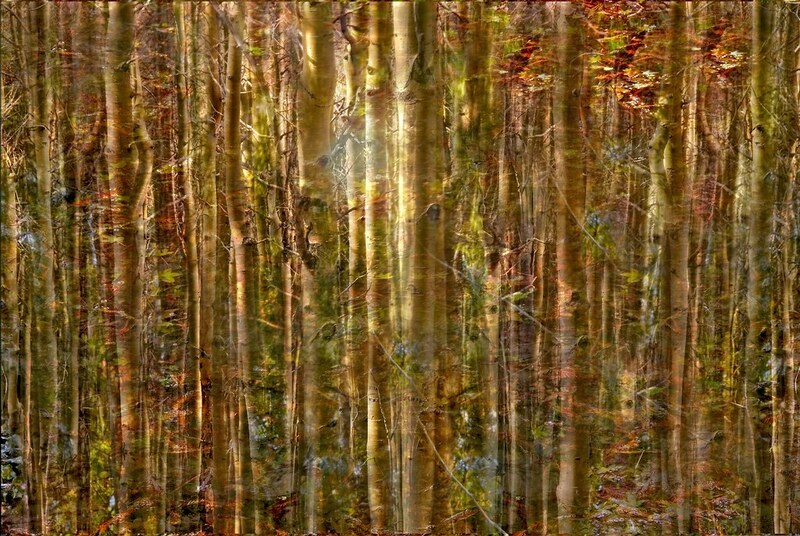 I used mirror rotations and image combinations to suggest the possibility of infinite depths to both the pond and the forest. Nautilus 69, photo by Harold Davis. View this image larger. This is a photograph of a mildly Photoshopped nautilus shell combined with a rotated version of itself. 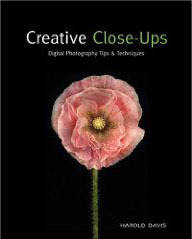 The mild Photoshopping consists of blending the original with a LAB color inversion of itself using the Multiply blending mode at a low opacity and a layer mask (created as described here) to eliminate the black background of the inversion. I have a feeling that I’m going to be photographing this nautilus some more! 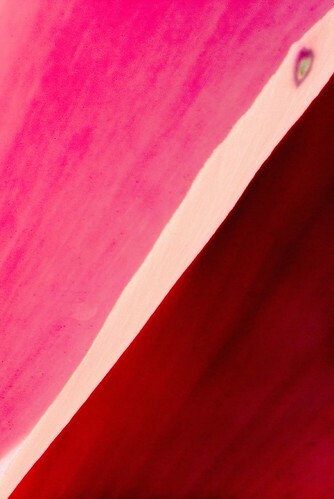 Cyclamen, photo by Harold Davis. View this image larger. For me, there’s also a technical hurdle overcome in the post-processing of this photo. Here’s the story. When I looked at the RAW file of the photo in Adobe Bridge, I saw that I would need to combine three exposures, one for the top petal, one for the bottom darker petal, and one for the light petal edge in the center of the image. This kind of portional image processing from the RAW original is pretty typical. 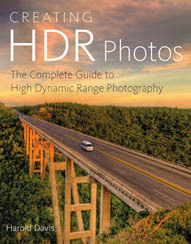 It’s been remarked that it is taking the Ansel Adams zone system to a place where only digital could bring it, by allowing saturated exposures all along the dynamic range of the photo. 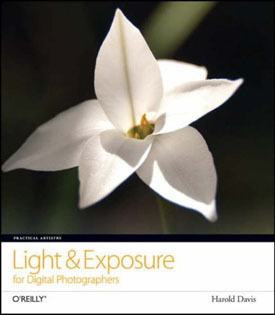 Typically, I combine the different exposures from the RAW original using layers and layer masks. You can either paint on the layer mask, or use a gradient to selectively add portions of the image. My problem was dealing with the white center of the image, which needed to be underexposed relative to the other image components. I saw immediately that neither paint brush nor gradient technique would really work here. Gradients were clearly out, as there was nothing to blend. Using a paint brush on the relatively small center strip would lead to a halo effect around the strip, no matter how careful I was. It was time to create a layer mask using brains, not brawn. Here’s what I did. I took a duplicate of the center component exposure and converted it to LAB color. Next, I inverted the luminosity channel to come up with a reverse image of the white strip (it was now mostly black). I threw away the A and B color channels, leaving me with an alpha channel, which I converted to Grayscale and then back to RGB mode. 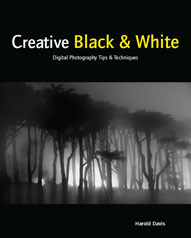 I then used Image > Apply Image in Photoshop to convert the inverted black and white RGB image into a layer mask for the layer that I was using to control the exposure on the white strip. This worked perfectly. The Image > Apply Image command (and related dialog) seems pretty confusing, and it took me a while to get it to work right. 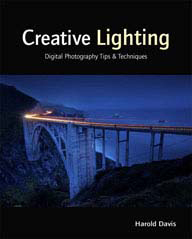 The secret is to remember that the active image in Photoshop will always be the target for the command. So I had to make sure that the right layer in the image I was working on (and not in the image that was to become the layer mask) was active before invoking the command. I also had to make sure to check the Mask box in the Apply Image dialog to convert the inverted image into a layer mask. All that said, this is a great time saving technique that is a lot more accurate than selecting or painting. I think that one will often be able to find a channel in one color mode or other than can easily work well as a layer mask. 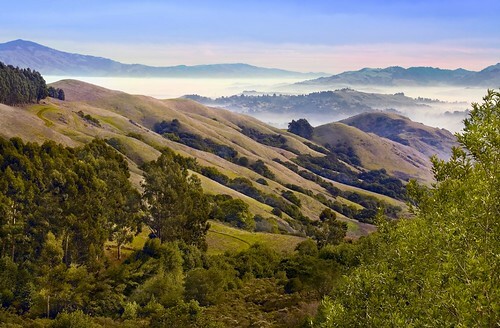 Mount Diablo and the Foothills, photo by Harold Davis. Protected with PIXSY . On Christmas Day 2006 the coastal range was bathed in clouds that made the scene look like Chinese ink brush landscape paintings. I took a picture looking west at San Francisco from the top of the ridge, and the image above of Mount Diablo looking east. Light at the End of the Tunnel?, photo by Harold Davis. View this image larger. Like World without End and Endless Stairs, I created this image by pasting in reduced versions of itself on Photoshop layers. 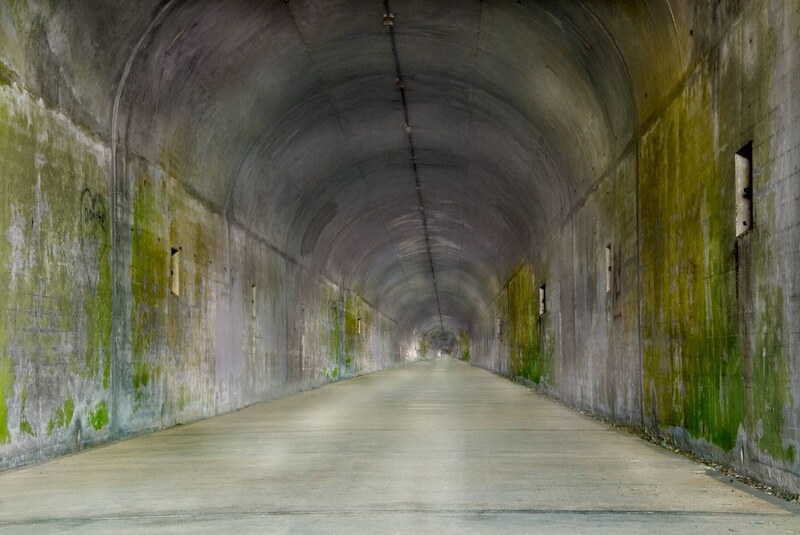 Like the doorways in World without End, as a final step I created a super-sized enlarged version of the image and pasted all the already almost infinite tunnel into it. This means that to really see how long the tunnel is you’d have to examine a large print with a magnifying glass, or get really close to the large Photoshop file on my 30 inch monitor. Or take my word for it. 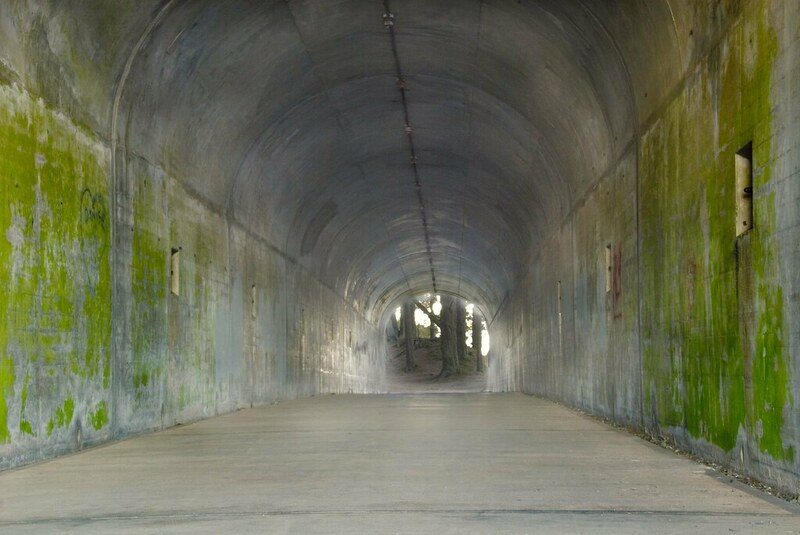 You have to ask, considering the view in the other direction from the mouth of this tunnel, why anyone would photograph inside this place! Tennessee Beach 4, photo by Harold Davis. View this image larger. Obviously, Tennessee Beach is a place of great beauty. 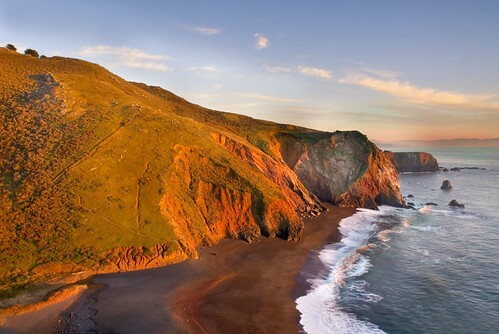 A more-or-less flat trail down Tennessee Valley takes you to this magical place in under two miles from the parking lot. This parking lot itself is only a couple of miles off the freeway, and a few exits north of the Golden Gate Bridge. Tennessee Beach is so easy to get to that I have the usual wilderness junky response to people who admire my photos of the area and say that they are inspired to make a visit: “Great, thanks, but do you really have to visit?” Only kidding. 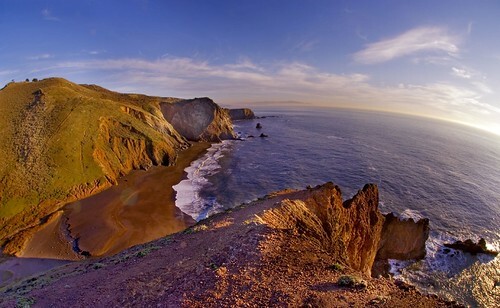 And, in response to the (I hope facetious) query on Flickr, Tennessee Beach is of course in California, not Tennessee. Does Tennessee even have beaches? Just kidding again, but not beaches like this one. In actual, historical fact Tennessee Beach is named after a ship, the Tennessee, that was shipwrecked on the beach. All passengers were saved, although they did have to camp out on the beach for a couple of nights. Double Hellebore Blossom, photo by Harold Davis. View this image larger. This is the first blossom of the hybrid double hellebore plants I got last autumn from Barry Glick, the self-styled Hellebore King, who runs Sunshine Farm and Gardens in West Virginia. 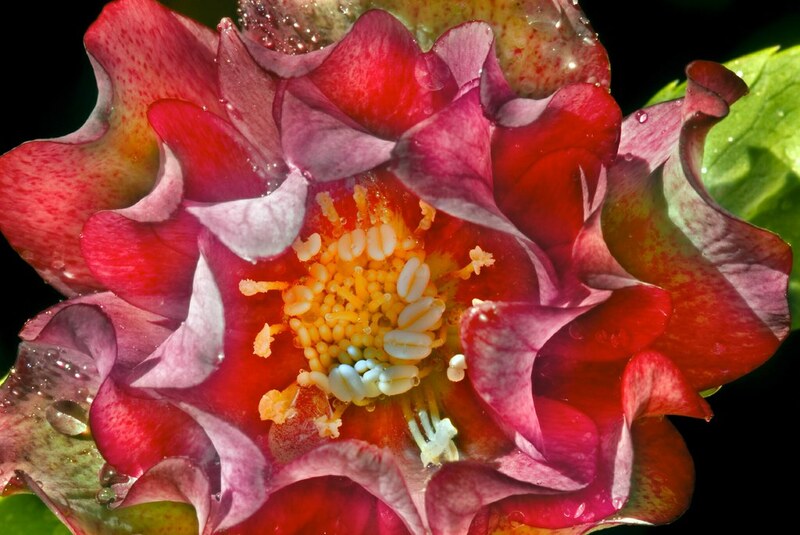 Hellebores have become one of my favorite flowers. Here’s an earlier photo of a rather more common helleborus from my garden. I’m not much given to fear of heights. But taking this picture made me feel a bit queezy in the pit of my stomach. It was taken with the camera on tripod looking straight down as the sun was setting on the cove without a name directly to the north of Tennessee Beach. It’s likely that very few people have ever set foot down there as it is pretty inaccessible. 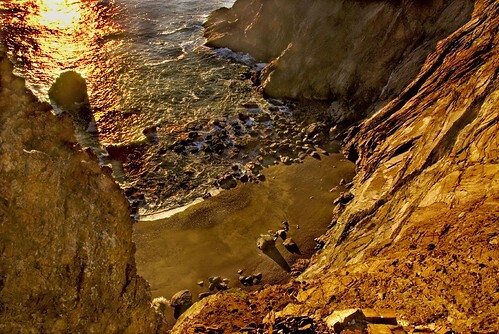 The camera was pointed down over the edge, I was pretty sure the tripod was stable, and of course I was in no real danger, but I felt a bit like a human fly hanging onto the ridge line hundreds of feet above the beach and ocean. 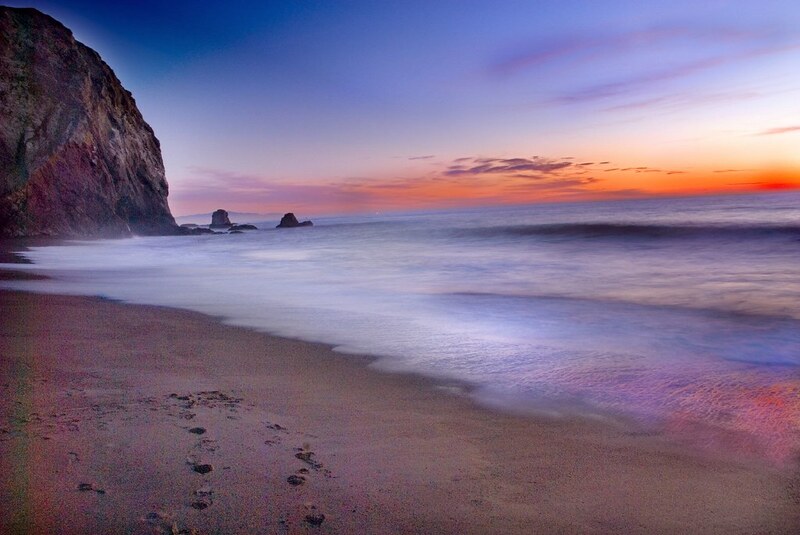 Tennessee Beach, photo by Harold Davis. View this image larger. 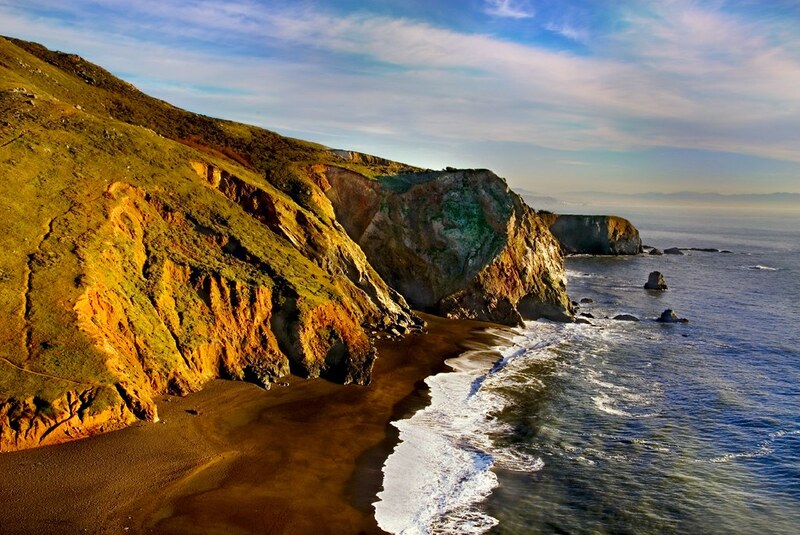 Here’s a broader view of Tennessee Beach looking south which shows, I think, the magnificence of the Marin Headlands landscape. This photo is best viewed in a larger size. I took it from the roof of the World War 2 vintage concrete bunker that sits towards the top of the hill on the north side of Tennessee Beach. Tennessee Beach Looking South, photo by Harold Davis. View this image larger. 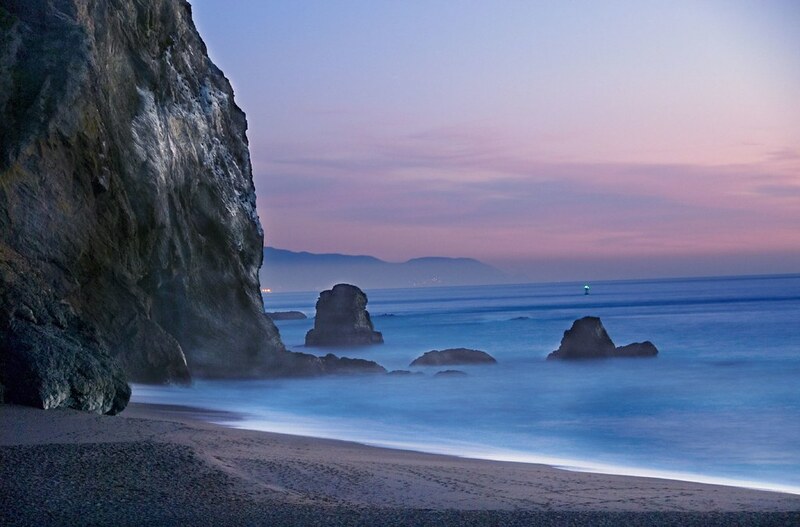 This is a photograph from Tennessee Beach looking across the Golden Gate at the sunset lights of South San Francisco. My last image of the session, it is a long time exposure (25 seconds, view the EXIF data). As I finished the exposure, I glanced out towards the sunset-darkened ocean and had to gather camera and tripod and run for my life as the spot I was standing was drenched by a rogue wave. 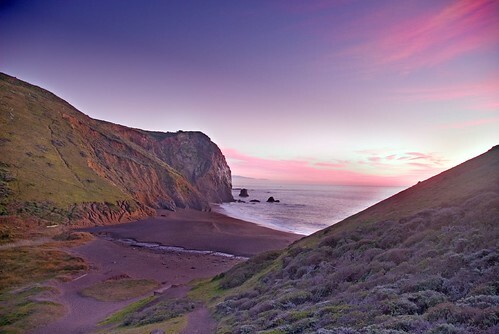 Walking back up Tennessee Valley I was alone as the stars came out. What a wonderful wilderness feeling, and how weird to get out of my hiking boots and drive onto the 101 freeway heading for a reception put on by an elementary school that Nicky might attend. 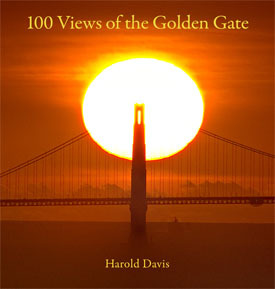 The juxtaposition of beautiful nature and crowded civilization in the Bay area is a stunning and dislocating thing for me. Wet Gazania, photo by Harold Davis. View this image larger. Yesterday in the bright sunshine I photographed this gazania and its water drops. 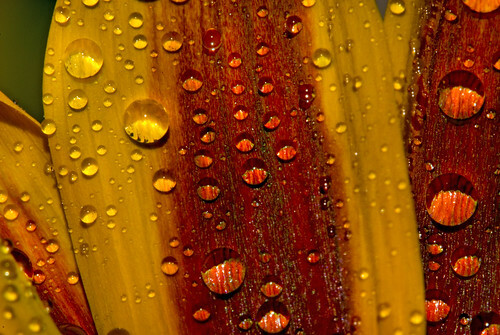 There’s something about a wet and well-lit flower that is undeniably appealing.